Good afternoon. My thanks to the Hong Kong Edition of China Daily for this welcome opportunity to speak to you today. 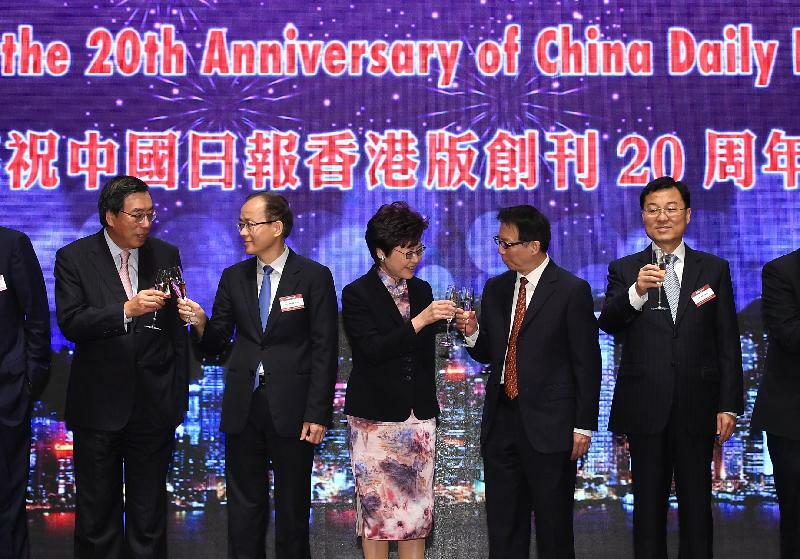 And my congratulations as well - the Hong Kong Edition of China Daily, like the Hong Kong Special Administrative Region, is celebrating its 20th birthday this year. Today's event is billed as a "roundtable" , although the head table is not a round one. Those of you with a fondness for tales of King Arthur will recall that his knights sat around a round table, a visible symbol that no one knight was above any other. Hong Kong may not enjoy quite the equivalent of Camelot's round table. But this administration believes in inclusion, in the community-wide opportunities that constructive dialogue can realise. I am sure attendees today will find much food for thought from distinguished speakers in the subsequent panel discussion. In two days' time, I shall deliver my maiden Policy Address, which I hope will contain not only initiatives for the coming year, but also my vision for the future of Hong Kong. While I do not intend to disclose any content today, you can be sure that opportunities for Hong Kong under the Guangdong-Hong Kong-Macao Bay Area and the Belt and Road Initiative will feature quite prominently. The theme of today's discussion is therefore a most timely and relevant one. The theme is also an inspiring one as it attempts to bring together these two critically important national development strategies. In other words, instead of approaching these in isolation, much synergy could be derived from interactions of both, particularly in shaping the future of Hong Kong. Indeed, I view the Bay Area development, first detailed by Premier Li Keqiang in his Government Work Report in March this year, as a key pillar for the Belt and Road Initiative. In my view, the Bay Area will serve as the gateway between the Chinese Mainland and the countries along the Belt and Road. Its air- and sea-cargo throughput leads the world, presenting a central passageway for air, land and sea transport linking countries along the Belt and Road. No less important, the Bay Area encompasses Hong Kong, Macau and such Guangdong cities as Guangzhou and Shenzhen, which are amongst the most international and economically advanced cities in the country. In fact, the Bay Area encompasses 11 cities and an overall population of 66 million. That, ladies and gentlemen, is greater than the United Kingdom's. And the Bay Area's overall GDP, at US$1.36 trillion, represents 12 per cent of the GDP of our whole country, and is equivalent to that of Australia. Hong Kong's contributions within the Bay Area towards the Belt and Road Initiative are unique, thanks to "one country, two systems". During my first official trip to Beijing in August, I secured the Central Government's blessing for Hong Kong to enter into a comprehensive agreement with the Mainland on our participation in the Belt and Road Initiative. We have since then been in active talks with the National Development and Reform Commission on the content of the agreement, and I look forward to putting pen to paper, hopefully before the end of this year. As we see it, Hong Kong, the most international of the Bay Area's cities, already serves as the multilateral bridge between the Mainland and the rest of the world. It's a role we will continue to play for the Bay Area - as a gateway for multinational companies accessing the Mainland market and as a springboard for Mainland companies seeking to "go global". Mainland investment in Hong Kong will increase as the Belt and Road Initiative gains traction. We are, after all, a global financial services capital - the world's largest offshore Renminbi business hub and an international asset management centre. We are, as well, China's international financial capital. Hong Kong, in short, is well placed to provide highly professional risk assessment and management services to Belt and Road projects and to meet the rising demand for fund-raising and financial-management services amongst Chinese companies taking part in such projects. And Hong Kong's lauded professional services sector, which works to the highest international standards, can offer a wide range of other services, from consulting, law and arbitration to insurance, construction, project management and more. One area which I would like to highlight is innovation and technology. We aim to develop an international innovation and technology hub in the Bay Area which will no doubt also contribute to the Belt and Road Initiative. At the moment, a high-tech industrial belt, set in motion by the Mainland's innovation-driven development strategy, already powers the Pearl River Delta Region. Guangzhou and Shenzhen specialise in innovation and technology industries, while Foshan, Zhongshan and other cities focus on advanced manufacturing. If Hong Kong does not wish to be left behind, it is important for us to join hands with these cities in the Bay Area in the development of the innovation centre. Indeed, after three months of intensive learning on the job, I am convinced that innovation and technology will help power Hong Kong's future economy, improve people's livelihood and create quality jobs for young people as well as opportunities for young entrepreneurs. It will therefore be a priority area for my government. As I see it, Hong Kong has a lot of potential in this field. For example, we have a clear competitive edge in R&D capabilities. We enjoy free flows of ideas, talent and capital. Intellectual property is highly valued here and it is protected under our common law system. In fact, our vibrant start-up environment already attracts a world of interest and we are regarded as one of the fastest-growing technology start-up ecosystems in the world. Today, some 2 000 innovation and technology start-ups and about 50 incubators are based here in Hong Kong. That, ladies and gentlemen, is up 24 per cent over the same period last year. I am glad to note that Guangdong and Hong Kong share the common goal of developing the Bay Area into an innovation and technology hub. I have met Guangdong Governor Ma Xingrui twice already since July 1 and we are both committed to this joint venture, which will certainly be a win-win proposition. Hong Kong can contribute to the development as our international networks can connect the Bay Area with international markets. And we are well versed in global technology trends and technical standards, thanks to a base of highly skilled workers supported by well-respected tertiary institutions. At the same time, Hong Kong is set to benefit from the collaboration with other cities in the Bay Area as it would provide our businesses with better access to the manufacturing hub of the Pearl River Delta and ample opportunities in the huge Mainland and Belt and Road markets. Add it up - Hong Kong is best positioned within the Bay Area to play a key role in turning the Belt and Road vision into business opportunities. All these opportunities, provided they are seized in a timely and proactive manner, will translate into tangible benefits for enterprises and professionals in Hong Kong. Beyond its economic value, the Bay Area has the potential to emerge as an appealing lifestyle centre as well as a showcase for co-operation between the Mainland, Hong Kong and Macau. So what will it take to realise this dynamic future? First, co-operation will be critical. We will need to reach a consensus on a clearly defined set of roles for each city within the Bay Area, if we are to minimise adverse competition and duplication of resources. This would produce better synergies and enhance the global competitiveness of the Bay Area as a whole. Looking at Hong Kong, I believe we must enhance our status as international financial, trade and transport centres. We must also develop our emerging industries. That includes, in addition to innovation and technology which I mentioned earlier, legal and dispute-resolution services, the creative sector, medical and health services and higher education. Second, we must, while upholding "one country, two systems" and Hong Kong's unique strengths, facilitate the free flow of people, goods, capital and information within the Bay Area. A case in point, educational institutions, research and development centres and scientific research institutions in Hong Kong can apply for science and technology project funds in the Mainland, but they cannot use those funds in Hong Kong. This, of course, is a barrier to co-operation in scientific research. In everyday life, Hong Kong residents living and working in the Mainland are still facing barriers in some areas such as education, social welfare, transport and travel. Not surprisingly, this has discouraged some Hong Kong people from exploring opportunities in the Bay Area. Thanks to the announcement by President Xi Jinping in his keynote address in Hong Kong on July 1 this year that various CPG ministries will roll out concrete measures to provide more convenience to Hong Kong people working and studying in the Mainland, there is some good news. For example, since August, the China Railway Corporation has introduced self-service ticket machines that can read Hong Kong people's Mainland Travel Permits in about 210 stations, including Beijing, Shanghai, Zhejiang, Fujian and Guangdong. This has shortened the time it takes for Hong Kong people to buy and collect train tickets. We expect more supportive policies and measures from the CPG to be rolled out as the Bay Area development gathers speed. There's more on the way to boost connectivity between Hong Kong and the rest of the Bay Area. The Hong Kong section of the Guangzhou-Shenzhen-Hong Kong Express Rail Link will take passengers less than 50 minutes to get from West Kowloon to Guangzhou, while the Hong Kong-Zhuhai-Macao Bridge will reduce travelling times between Zhuhai and Hong Kong International Airport to 45 minutes, down from the current four hours by road. And a new land control point at Liantang/Heung Yuen Wai will open on the eastern part of Hong Kong and Shenzhen, enhancing connectivity to the eastern part of the province. As we all know, Hong Kong's shortage of land impedes the expansion of many industries. Similarly, Hong Kong's market is small, limiting growth potential. The enhanced connectivity between Hong Kong and the rest of the Bay Area would allow us to tap into the latter's land, labour and capital resources, while opening up a market almost 10 times our domestic one. In creating a business environment for the Bay Area that is globally competitive, new policies are expected to better implement the liberalisation measures under the Closer Economic Partnership Arrangement and to promote the convenient flow of factors for production. These will certainly provide new impetus to the development of Hong Kong. All cities in the Bay Area are excited about the future prospects and are pressing full-steam ahead with the development. On the day my government took office, I signed a framework agreement with the National Development and Reform Commission and the governments of Guangdong and Macau on the Bay Area development. In mid-August this year, the Commission formally consulted the governments of Guangdong, Hong Kong and Macau, as well as relevant Mainland authorities, on the Bay Area Development Plan. We have proposed a variety of measures regarding Hong Kong's participation in the Bay Area and, through relevant policy bureaux, we have solicited the views of industry sectors and advisory bodies, reflecting their input to the Commission. We expect the Bay Area Development Plan to be formalised by the New Year. 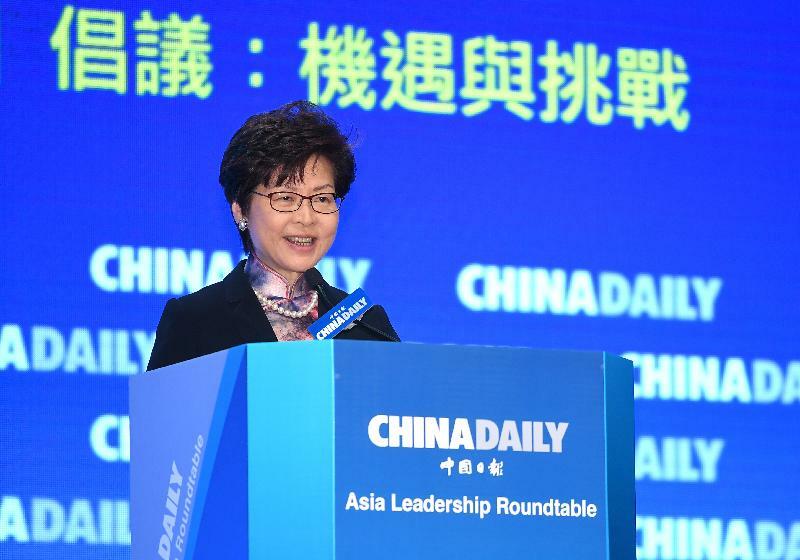 Playing an active role in taking forward the Bay Area development will be the Government's major task in taking forward co-operation with the Mainland. In the end, the development will, I'm confident, give full play to the strengths of Hong Kong. It will cement our position as the key international gateway to the Mainland and elevate our role in China's opening up. Ladies and gentlemen, for the Belt and Road Initiative and the Bay Area development to achieve their goals, it is important that the Government, business and the community work together to tackle the challenges and impress upon our younger generation the many opportunities ahead. I appeal to community leaders like your good selves to continue to maintain a keen interest in these national initiatives. Lastly, may I again congratulate China Daily Hong Kong Edition on the 20th anniversary and wish it every success in its future endeavours.